The exact date of the celebration of the first Catholic mass within the boundaries of Holy Redeemer Parish, Chatham can’t accurately be determined. It could have been celebrated by French explores, Basque fishermen, Norse adventurers or even St. Brendan the Irish saint. The first recorded Catholics on Cape Cod were employees of the Sandwich Manufacturing Company who in 1827, petitioned Bishop Benedict Fenwick of Boston to send a priest to that community to serve a sizable number of Irish Catholics working in the glass works. As early as 1850 Chatham is noted as being a mission station of the Catholic parish in Sandwich. The Catholic community in Chatham must have been very small because the first recorded celebration of the Holy Eucharist in Chatham was not until February 2, 1855, when Fr. William Moran celebrated Mass at the home of Patrick and Ann (Clark) Drum. A month later he returned to baptize their son John Henry Drum on March 8, 1855. However, there is a dispute as to whether the Drum family were actually residents of Chatham or Harwich. Growth in the Catholic community on lower Cape Cod was tantalizingly slow. During the second half of the Nineteenth Century the center of Catholic life fluctuated between Harwich, Wellfleet and Truro as the Catholic community shifted according to local economic conditions. An exception was Provincetown. There a sizable and stable Portuguese fishing community was able to sustain a permanent parish beginning in 1869. The growth of a sizable Catholic population in Chatham only developed with the building of the large summer hotels. Most notable of these was the Chatham Bars Inn which still plays an important role in the Chatham community. The service staff of these hotels were mainly young Irish girls employed as maids. In 1901, the Chatham mission station was moved from the jurisdiction of the Wellfleet/Truro parish and was attached to a new parish centered in Hyannis. The Hyannis parish had a territory that covered all of the towns of Barnstable, Yarmouth, Dennis, Harwich, Chatham and Brewster. In 1904, as one of his first official actions Bishop William Stang, first bishop of Fall River, reestablished Holy Trinity parish in Harwich. Chatham was placed under its jurisdiction. At the turn of the Twentieth Century Chatham was still without a Catholic Church. The mass was celebrated on an intermittent basis in private homes. 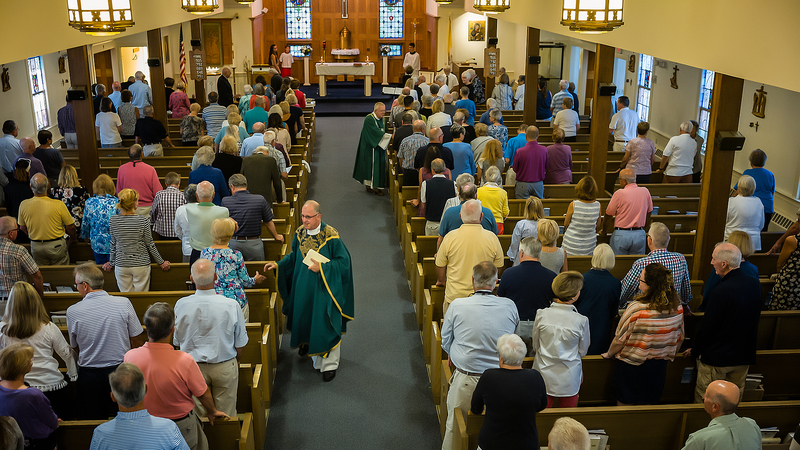 During the summer season Masses were celebrated on a more regular basis with the assistance of a Redemptorist priest from the Mission Church in Roxbury, MA. It was probably this priest who introduced the Novena to Our Lady of Perpetual Help that continues to be recited every Monday after Morning Mass. In 1908, Bishop Daniel Feehan visited the lower Cape to assess the pastoral needs of the area and in the process confirmed eighty-four people. In 1910, Bishop Feehan turned to the Sacred Hearts priests centered in Fairhaven, MA to attend to the pastoral care of the lower Cape towns from Harwich to Provincetown. A shortage of clergy still prevented the establishment of a Catholic parish in Chatham. From 1910-1915 mass was celebrated in Chatham and Harwich on alternating Sundays. The Liturgy was celebrated in the homes of parishioners Matthias Slavin, at the corner of Seaview Street and Highland Avenue, the home of Benjamin Eldridge, (the current Rectory) on Highland Avenue and the Danforth Home on Shore Road. During the summer of 1915, Mrs. John Curtis, a non-Catholic allowed her bungalow to be used for mass. A Passionist priest from Brighton, MA was engaged to celebrate Mass on a weekly basis that summer. Finally, in 1915, preparations were made to begin the building of a church on Highland Avenue on land donated by Matthias Slavin. The church was of Gothic Revival style on the pattern of English country chapels of the 12th and 13th Centuries. Ground was broken for Holy Redeemer Church on November 30, 1915. It was constructed by the New Bedford construction company of Maher and Winchester for a cost of $7,889.30. Building progress was such that the church was available for the celebration of its first Mass on June 25, 1916. It was solemnly dedicated by Bishop Daniel Feehan on Sunday, August 27, 1916. The growth of the Holy Redeemer community continued to be slow for the next three decades. It remained a mission station under the pastoral care of the Sacred Hearts priests of Holy Trinity Parish in Harwich. In 1950, in anticipation of Holy Redeemer becoming its own parish, Fr. David Sullivan, a curate at Holy Trinity, Harwich was given the primary responsibilities of the pastoral care of the Chatham Catholic community. In 1953, those responsibilities were assumed by Rev. Theodore Brennan. Fr. Brennan was the true founding father of Holy Redeemer Parish and both its physical and spiritual builder. Fr. Brennan was born and raised in Ireland. Between the time of the beginning of his priestly training in Ireland and his entering the Sacred Hearts Novitiate in Wareham. Fr. Brennan worked in the building trades in New York. Almost from the moment he came to Holy Redeemer Fr. Brennan began to put his building experience to good use. In December of that year he began a church expansion that greatly increased the seating capacity of the church. The work was done by June of 1954 and on July 21, 1954, Bishop James Connolly rededicated the expanded church. On May 1, 1955, Holy Redeemer parish was finally established. Fr. Brennan was named its’ first pastor and he was assisted by Fr. Jeremiah Casey. At that time the Eldridge home across the street from the church was purchased as a rectory. Fr. Brennan was also responsible for the purchase of the former Doan and Beale Funeral Home next door to the church and for the invitation to the Missionary Sisters of Our Lady of Victory who came to assist with religious instruction for the children of the parish. Fr. Brennan continued to be the parish builder. In the early 1960s he purchased sixteen acres of land in S. Chatham and commenced the construction of the Our Lady of Grace Chapel. Ground was broken for the chapel in the summer of 1962 and it was opened to serve the large summer attendance in 1963. In October 1964, Fr. Brennan was transferred to the pastorate of St. Joseph’s Church in Fairhaven, MA. Fr. Brennan was succeeded as pastor by Rev. Paul Price 1965-1969, Fr. Daniel J. McCarthy 1969-1972, and Fr. William McClenahan 1972-1974. Holy Redeemer wasn’t to see the last of Fr. Theodore Brennan. He returned as pastor a second time in April 1974 in time for the twentieth anniversary of the parish. Again Fr. Brennan was to renovate and expand Holy Redeemer Church. Those renovations commenced in 1980. Once completed in May of that year the church was again dedicated for a third time by Bishop Daniel A. Cronin, Bishop of Fall River. Fr. Brennan continued as pastor of Holy Redeemer until his retirement in 1984. Fr. William McClenahan returned to succeed the retiring Fr. Brennan and was to be the last Sacred Hearts pastor at Holy Redeemer. In 1988, the Sacred Hearts priests decided to withdraw from the lower Cape parishes that they had served faithfully for seventy-eight years. Fr. James F. Buckley, pastor of St. Margaret’s Parish, Buzzards Bay became the first diocesan priest appointed as pastor of Holy Redeemer in June of 1988. In 1998, Joseph Mador was ordained a permanent Deacon. He was the first religious vocation from the parish. Fr. Buckley continued as pastor until the time of his retirement in February 2001. Rev. George Scales was made parish administrator for several months until June of that year when Rev. Jon-Paul Gallant became pastor. During Fr. Gallant’s tenure the 50th Anniversary of the parish was celebrated during 2005. Fr. Gallant was responsible for the installation of two stained glass window at the back of the sanctuary. One is of the Annunciation to Mary and the other is of the Resurrection appearance of Jesus to Mary Magdalene. The windows were salvaged from the former St. Elizabeth Church in Fall River. Fr. Gallant remained as pastor until June of 2008. At that time Fr. George Scales returned to Holy Redeemer as pastor. Fr. Scales entered sick leave in June 2017, and Rev. John M. Sullivan, the current pastor assumed the pastorate of Holy Redeemer Parish.